Blueprint Gaming has unveiled its latest game, a Spinal Tap slot, based around the fictional rock band. This is Spinal Tap came out in 1984 and followed the fortunes of a hapless rock band. Now you can step into their ludicrous shoes and spin the reels at your favourite UK casino site to win some sweet rewards. 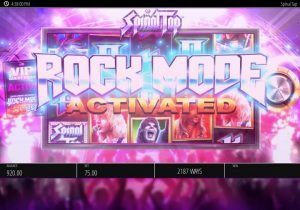 Whether you are a rock ‘n’ roller, a lover of comedy movies or just someone who likes to delve into the newest online slots, read this article to find out everything you need to know about the Spinal Tap slot from Blueprint Gaming. 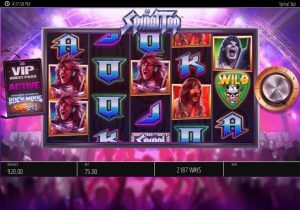 The Spinal Tap slot is a 5-reel, up to 2,187 ways-to-win romp through some of the most hilarious moments of the 80s film. As you would expect, there is a rocking soundtrack and spectacular visuals. Fans of the movie will feel right at home, as soon as they sit in front of this new online slot at their favourite UK casino site. You can play Spinal Tap at LeoVegas right now. Spins cost between 30p and £30, with the chance to win 1,000x your stake. Simply set a bet level you are happy with, then tap the button and get going. The spin button in this case is an amp knob, which goes up to 11 in honour of one of the film’s most quoted scenes. Nigel Tufnel (Christopher Guest) explains that his guitar amps are louder than usual amps because the knobs on his go up to 11, rather than 10. There is a mark that moves round the knob during your game play and when it reaches the mythical 11, you hit Rock Mode and add an extra two reels to the proceedings. This boosts it from a 243 ways-to-win game to a mighty 2,187! You also gain access to one of a number of features, depending on where the needle of the onscreen record points. You can either enter Rock Mode by pushing the knob up to 11, or you can buy your way in for 50x your stake. Bonus Odyssey – More Bonus symbols hit the reels, upping the chances of winning. Rock ‘n’ Roll Spins – Respins that continue until there is no new matching symbol for the winning cluster. Wild Sparks – Wilds take over other symbols at random. Heavy Duty Wilds – Turns reels wild, often adding multipliers too. There are also a host of other bonus features in Spinal Tap. Hit three bonus symbols and you earn entry to one of seven bonus features. If you land four bonus symbols, the lower value bonus rounds are taken away, leaving you with the premium games. You can gamble the bonus you receive, with the potential to up your possible payout. Double Fret It Bonus – Pick prizes from mystery boxes. Awards paid in cash. Double Platinum Bonus – spin and win various prizes, including mulitpliers and the chance to take on other bonuses. 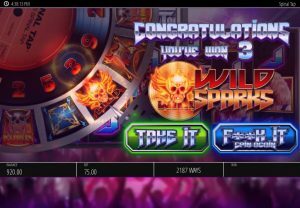 Encore Free Spins – 11 free spins, with Wilds racking up and hitting the reels for the last spin. Record Deal Bonus – Pick prizes from boxes. Stairway to Hell Free Spins – 11 spins with the potential to earn multipliers up to 11x. Stonehenge Free Spins – 11 spins with Wild Zones which trap Wilds and keep them on the reels. World Tour Bonus – Spin and move along the steps through different areas of the world, with the chance to earn multipliers of up to 20x. Try to make it to the Big Money Bonus at the end. What is Spinal Tap Like to Play? The Spinal Tap slot is everything you would expect from a film spin-off. There’s a great rock soundtrack, plenty of allusions to the movie and great graphics. It’s all blacks, purples and flames – just what you hoped! The number of features is frankly amazing and keeps the interest far more keenly than many new online slots. It runs smoothly and is simple to grasp the concept of straight away. The ability to buy into the Rock Mode is neat for those with little patience, but this should entertain anyone for a decent amount of time. The 1984 movie was a mockumentary by Rob Reiner, following the band on tour. Lead singer David St Hubbins is played by Michael McKean, guitarist Nigel Tufnel by Christopher Guest and bassist Derek Smalls by Harry Shearer. The running joke throughout the film is that they have churned through a number of drummers who all died in increasingly bizarre manners. The film is regarded as a cult classic, which has finally been given the online slot treatment by Blueprint Gaming. You can play the Spinal Tap slot right now at a host of UK casino sites. LeoVegas is one of those sites, where you can pick up 20 free spins without even depositing. Visit through the link below to register and earn this great deal.